Every once in a while a product comes along that is so similar to it's expensive, brand name counterpart that a double take is necessary. The first time I saw this saddle bag (above right), I had to look twice to be sure it wasn't the ultra exclusive and expensive bag from Chloé. Unless you see the bags side by side, it's almost impossible to tell the difference. And the incredible difference in price? Let's just say it's crazy. Cuh-razy. Looking to spend our tax return check? 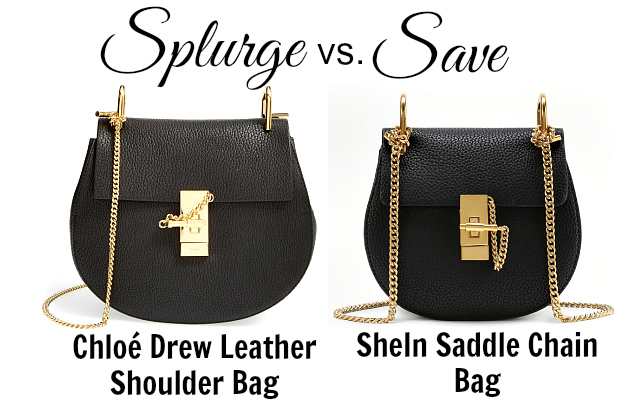 OK, if you must have the Chloé bag, splurge away. Want to save big you so you have more to spend on iced lattes, cute tops, and shoes? Grab the SheIn bag while it's still available.